We confess that we aren’t entirely sure what to do with this piece - it belongs to a group of interesting gem crystals that are small and durable enough to be incorporated into some custom jewelry design, yet are equally interesting as collection specimens. We have seen only a few pieces of this highly saturated variety from Molo - in fact, this type usually has enough Cesium to test as Pezzottaite, the Beryl analog. 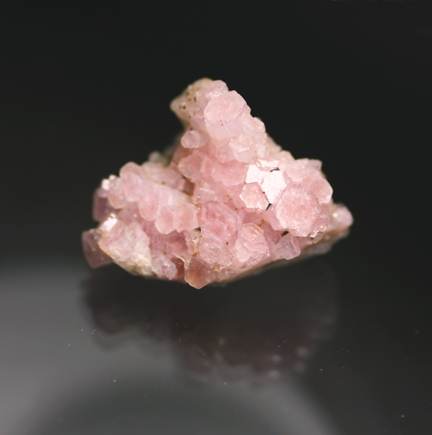 A lovely group of well terminated hexagonal crystals clumped together and very pink at their tips. On a thin bit of matrix as well. Fascinating.